Let's continue our look at the most skilled young players in the game by moving on to hitters. Let's take a closer look at a bunch of highly-skilled young performers. Jake Bauers (1B/LF, TAM) has looked like a future impact bat in his rookie season. He has shown good patience at the plate (13% bb%), and the strong power he has displayed has the backing of a 135 xPX. In addition, his batting average (.245 BA) isn't a lost cause. His .281 xBA gives it immediate upside. At age 22, Bauers remains one of the game's best investments among young bats. Alex Bregman (3B/SS, HOU) has emerged as an elite bat in 2018. Only Betts, Ramirez, and Trout have posted better skills among young bats than Bregman: 13% bb%, 86% ct%, 1.09 Eye, 157 xPX, 109 BPV. He's firmly an elite bat against lefties (1.035 OPS, 160 PX vL). But he's also producing at the highest levels of his career against same-sided arms (.876 OPS vR). Max Kepler (RF, MIN) is another young bat who is on a growth curve. Beneath Kepler's marginal stat line (.228 BA, .733 OPS) are some solid reasons for intrigue. For one, his plate discipline is strong (11% bb%, 82% ct%, 0.70 Eye). And he possesses underlying power skills that are well above average levels (123 xPX). His 90-mph exit velocity is significantly above the norm too. Jurickson Profar (SS/3B/2B/1B, TEX) has delivered on his post-hype profit potential in 2018. His plate discipline continues to mature (9% bb%, 85% ct%, 0.65 Eye), and his pop has shown flashes of his former top prospect upside. He had a 113 PX and 124 xPX in June. His speed tools have been on display in July (142 Spd, 157 RSpd). And his batting eye has improved in each of the past three months: 0.35, 0.67, 0.88 Eye. He'll carry significant breakout potential heading into 2019. Eddie Rosario (LF, MIN) has proven that his mini-breakout in 2017 was no fluke. He's on pace for his first $30+ season, and his underlying skills support most of it. His 117 PX is supported by an even better 130 xPX. His rate of hard contact is on a two-year upswing too: 89, 103, 114 HctX. And there's more upside here if he can figure out lefties (.721 OPS vL). Andrelton Simmons (SS, LAA) seemingly is a veteran at this point in his career, but at age 28, he's entering the peak of his production. And he's doing so with the best plate discipline in the game: 7% bb%, 95% ct%, 1.56 Eye. His ability to consistently put the bat on the ball pairs nicely with his 125 Spd, giving him 20+ SB upside if he can get more opportunities to run. Wilmer Flores (3B/1B, NYM) is another bat with a lot of MLB experience at a young age. The 26-year-old hasn't done a whole lot on the surface in 2018 (.271 BA, .781 OPS in 240 AB), but the growth in his plate discipline has been substantial: 8% bb%, 90% ct%, 0.96 Eye. He's hitting righties with authority now (.843 OPS vR). Alen Hanson (2B/3B/SS/RF, SF) has cooled off after the immediate impact he made following his recall from Triple-A. That said, Hanson still owns an interesting combination of good contact skills (85% ct% in July) and impactful wheels (128 Spd). Pitchers have adjusted to him after his quick start, so he'll need to adjust his approach to have a strong second half. Rhys Hoskins (LF/1B, PHI) has been on fire since the start of June. He put up a 1.088 OPS in June and has followed that up with a strong finish to July (.908 OPS). His expected batting average has jumped nearly 40 points from the first half to the second half, and he has put up an elite 150+ xPX in three separate months. At age 25, Hoskins will carry some legitimate 40-HR upside heading into 2019. Ketel Marte (2B/SS, ARI) is another pre-peak bat who entered the 2018 season with breakout potential. He got off to a slow start (.240 BA, .703 OPS in 1H) but has really come on in the second half. Few bats have been more skilled since July 1 than Marte. His 101 BPV has helped to produce a .280 BA and .893 OPS. His plate discipline has been firmly elite in the second half too: 16% bb%, 85% ct%, 1.27 Eye. At age 24, Marte still has time to develop into an impact middle-infielder. Joc Pederson (CF, LA) has enjoyed a big bounceback season so far in 2018. He owns an .878 OPS in 259 AB, and only Machado and Soto have posted better skills among NL bats than Pederson (96 BPV). In fact, Pederson's skills feature both good plate control (10% bb%, 82% ct%, 0.62 Eye) and plenty of pop (148 PX, 136 HctX, 146 xPX). Gregory Polanco (RF, PIT) is another young NL bat entering his peak production years. He is on track to put up the first .800+ OPS of his career (.844 OPS). He is drawing more walks than ever too (12% bb%). And he's hitting more flyballs than ever (34/16/50 G/L/F), helping to give him even more underlying power than he is showing (135 xPX). Eugenio Suarez (3B, CIN) was drafted as a fringe frontline 3B in many leagues (187 ADP). He has given his owners a big profit so far in 2018. He has a .301 BA and .968 OPS in 332 AB. And that jump in production has been no fluke. He owns an elite 151 HctX and 170 xPX combo, and he hasn't sold out his plate approach to reach those levels (11% bb%, 76% ct%, 0.53 Eye). 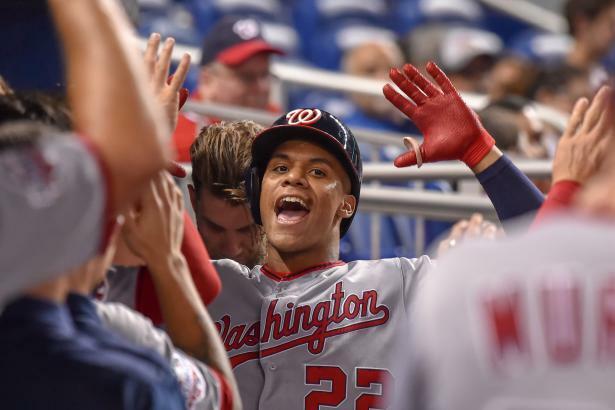 Juan Soto (LF, WAS) has exceeded his hype to this point in 2018, becoming one of the best young bats in the game at age 19. Soto's .995 OPS has come with the backing of an upper-tier 95 BPV. His plate skills have been sturdy too: 16% bb%, 78% ct%, 0.84 Eye. He has been particularly lethal against same-sided pitchers (1.157 OPS, 170 PX vL).